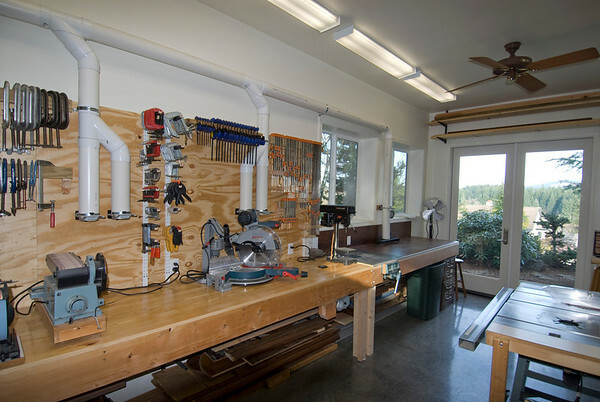 Kelly and I moved to Camas, Washington in the second half of 2010 - and I promptly began making space for a new wood shop while getting all the clocks, the clock shop, and the garage organized. This gallery will give you an idea of where all our clocks and tools now reside. The photos in this gallery are organized to give you a walk through tour of the shops - starting with the construction of the new wood shop, then shots of the wood-working shop, moving into the floor-standing clocks area, then on into the garage, and finally the clock shop. While each of the shops will continue to change as I make them more workable (and possibly buy one or two more tools), at least the following pictures will give you an idea how it all was in early 2011.